Ronni Eloff, Executive Director WITI WINs, introduced Joanne Moretti, Jabil Marketing SVP, who set off the event by welcoming 120+ players to the WITI SET Symposium, where there were six panels showcased new technologies coming to our sports and entertainment fields soon. "How Player Tracking is Changing Insights." Jill Stelfox: Vice President & General Manager; Location Solutions, Zebra Technologies. Jill shared Player Tracking information as our first keynote in a session that enlightened attendees about shoulder pad sensors, which on-field tracking enables fans to view never-before-seen real-time player data, such as, speed, acceleration, and in-depth analytics. "Sports, Tech, Fashion, and Alphas: A Unlikely Woman's Breakthrough to Success"
Claire Ortiz: CEO, ORTIZ Industry Inc.
Claire spoke about her underprivileged past and how she turned into an industry leader and front runner within highly competitive performance sports fashion. Her takeaway? Always be searching for the opening that allows you to step forward. "Top 10 Leadership Tips for Breaking through the Class Ceiling." 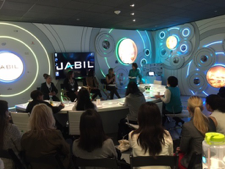 Joanne Moretti: Senior Vice President/Marketing & Sales Enablement, Jabil. Joanne shared with the audience strategic activities everyone can apply to their professional space to help advance their careers. A favorite was #6 "Your Network is your #1 Personal Asset. Build it, Strengthen it, Learn from it and very importantly, build your Brand inside it." Wearables - Fashion? Fad? Future? - Claire Ortiz, CEO, ORTIZ Industry, Inc.
"The Immersive Experience: Enhancing Human Interaction"
- Heather Furby: CEO and Co-Founder, Creative Age Leadership, Inc.
Before the final Keynote and after the last panel sessions, Jabil staff provided guided tours of the Jabil Blue Sky Center to the Symposium attendees. Unfortunately, one of the last Keynote speakers Juliana Paoli, CMO, of the San Jose Giants could not be with us due to an emergency. We want to thank all the panelists, Keynote Speakers, Exhibitors and our Sponsors, San Francisco American Marketing Association, Monticello Vineyards, Ford, PWC for supporting this event. 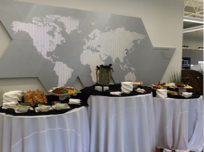 We especially want to thank our co-host and partner Jabil and the Blue Sky Center staff for the usage of the Blue Sky Center and their collaboration with this event.